Good morning! I've been seeing the cutest Anya cards being made, and it's inspired me to pull out one of my favorites, Teacher Anya. I love this sweet image. I tried to photograph Sabrina holding an apple on her first day of school this year, and she kept wanting to take a bite out of it... I kept telling her that it was just a prop, but she wasn't having anything to do with that! I used Karen's Sweet Sunday Sketch #33 for my layout. I first stamped and colored Anya on white cardstock, then I chose my patterned paper which has cream instead of white as a neutral in it ~ do you ever do that? I swear I do it all the time! Instead of redoing my image, I decided to sponge around her to create an inner glow. 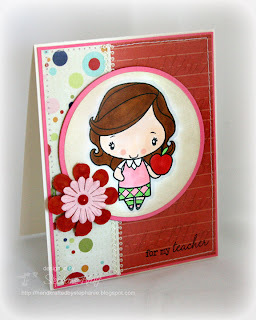 I'll be adding this card to my teacher card stash! Accessories: Circle Nestabilities (Spellbinders), Markers (Copic), Flowers (Imaginisce), Pearl (Kaisercraft), Picot cord, Foam tape, Thread, Sewing machine. I swear I think those Anya stamps are like magic -- I don't think I've seen a card made with an Anya stamp that I don't like. They're just irresistable! gorgeous!! sweet image and I love the colour combo you have used! This is so cute! I do the white/cream thing all the time. I just like white better for coloring. This is SO cute! I love this little image and the coloring ROCKS!